Jasmine Cottage situated in a rural hamlet close to Redon, Brittany. Jasmine Cottage is a pretty stone cottage just 1 km from the local village. 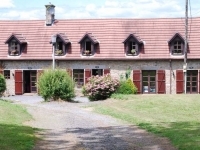 Comfortable detached village house near Locmine,Southern Brittany,sleeps up to 8.